It’s nearing that time of the year when nominations will be made for all kinds of awards, including the Padma awards of the GOI. There are many honourable men and women who have won the Padma awards; Girish Karnad, Shekhar Gupta, Rajdeep Sardesai, Barkha Dutt, Teesta Setalvad. The list is really in thousands. Sometimes an honour list is intriguing because of the notable absence of some names. MKGandhi’s name doesn’t have a Nobel against it. In an informal poll CNN once checked with film-direction students who they would like to interact with the most. The answer was unanimous: Martin Scorsese. Surprisingly, this legendary American director didn’t win an Oscar for 30 years. When they finally did give him an Oscar it wasn’t really for his best film at all. Ironically, most of the guys who won over Scorsese were actually actors who turned directors. This is one of those enduring Oscar conspiracies. The good thing, though, about the Oscars is that it it’s not a govt award. Conspicuous by absence in the list of Padma awards are some great names from Indian industry. No Samir Jain, no Vineet Jain – both media leaders and heads of the Times Group (TOI). I’m not sure, but I don’t think the current Ambanis figure either. Most shocking of all; Dhirubhai Ambani doesn’t figure. I often find the clamour for the Bharat Ratna for Sachin Tendulkar excessive and not entirely warranted. I also believe in due course of time Sonia Gandhi and Rahul Gandhi will be awarded the Bharat Ratna following Nehru, Indira and Rajiv. They are far more “entitled” to it than Sachin. Yet the one man who changed the face of Indian industry, got the ‘Aam Aadmi’ to participate in the equity cult, never failed to reward the small investor and is truly an extra-ordinary business story never got any such awards. Businessmen have been involved in politics from the time of our independence movement but it’s largely to the credit of Dhirubhai that politicians were turned into servants of big business. In this part let’s deal with DA and in the next part we will get to Samir & Vineet Jain of TOI. I am a great admirer of Dhirubhai. I share something with him but that is of no public interest. Despite all his faults he is truly the Aam Aadmi who inspired a whole new generation of Indians and Indian businessmen. I consider DA a far bigger legend than even Bill Gates. This is simply because DA succeeded in what was nearly a “business prison” called India for private entrepreneurs. So it wasn’t surprising that all our news channels so quickly jumped to defend Reliance and the Ambanis when Arvind Kejriwal made his latest allegations on Black Money. In normal course, if allegations are made against anyone our media would never present the facts or alternative points, at least not so promptly. There are a thousand times that Digvijay Singh has uttered nonsense that our news channels have reproduced without a challenge and without scrolling the facts when they carried his moronery. For all the frequent accusations by a Manish Tiwari they never fact-checked anything. Rajdeep Sardesai was more than happy to carry MT’s nonsense over and over again even in interviews with others without bothering to present facts. But when it came to the Ambanis CNN-IBN was the first to flash headlines that HSBC had apologised for wrongly listing Mukesh Ambani in their Swiss accounts list. This was even as AK was speaking at his presser on November 9. 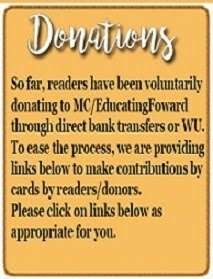 How the HSBC list was made, stolen and got out and the allegations are not of any interest in this post. 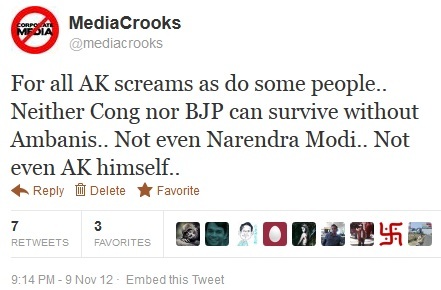 What is of interest is that this time AK had touched a raw nerve and life-line of our TV channels. 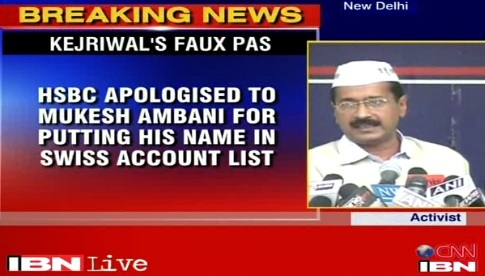 If CNN-IBN was the first, TimesNow and NDTV weren’t far behind to immediately carry the HSBC apology to Ambani as part of the headlines during AK’s presser. Don Regan, the late Chairman of Merill Lynch, became Treasury Secretary under President Ronald Reagan and then his Chief of Staff. As the Treasury Secretary, Don worked hard to get tax cuts for the rich. Somewhere in this video clip above Don even tells the president to “speed it up”. Nice, eh? Who runs the govt? Now is it hard to understand how much corporate America influences the govt? Is it any surprise then that corporate India virtually runs the GOI? This same Merill Lynch crashed in 2008 along with many other companies and was sold to Bank of America for less than a dollar per share. Dhirubhai not only started the culture of rewards and gifts for politicians but also for journalists. Post the Emergency when the Janata Party govt wasn’t friendly to his businesses he helped Indira Gandhi to unseat Morarji Desai. Who runs our govt? He helped Indira Gandhi to install Charan Singh as PM. The story includes trading of huge amounts of cash. Who runs our govt? And finally Charan Singh too was brought down and Indira Gandhi returned as PM. Naturally it would be fair for Dhirubhai to be rewarded for his help and support. When Pranab Mukherjee became the FM in 1982 things got even better. Now, can you imagine Dhirubhai telling Pranab: “Speed it up”? Quite possible, isn’t it? Since then Reliance has grown bigger and bigger. It now has a wide web of petroleum, communications, education, retail and many other businesses. It has also a strong web of media investments. You expect a CNN-IBN or NDTV to ever report on Reliance or Ambani? Even if Ambanis didn’t have direct or indirect investments in these media companies they are simply too big as even just advertisers. I sent out this tweet last evening and quite a few were perturbed. No, not because they disagreed but because they believed Ambanis aren’t “invincible”. Well, nobody is. But let’s try and deal with realities rather than hypothesis. Even if the govt had any proof for Kejriwal’s allegations and wanted to raid or investigate RIL why would they dare? In all probability RIL or Ambanis would have more dossiers on politicians and media persons than any govt investigating body. That’s conjecture but not far-fetched. Dhirubhai had to do business in a time when he not only had to fight the system but also circumvent it and also take care of many politicians and politics. After the Janata Party experience it didn’t matter which govt was in power. So why wasn’t Dhirubhai given any major awards? Interesting question! When he died in 2002 every Congress bigwig and every BJP bigwig was up and strongly recommended a Bharat Ratna for Dhirubhai (Read Here). He directly changed the lives of millions of Indians far more than some of the recipients so far. Not just govts but many small and big entrepreneurs depend on Reliance for their livelihood and earnings. Dhirubhai didn’t create the systems or the govt. On the contrary I would say if not for him many other entrepreneurs who would have been victims of our systems may have never sprouted. One way or other our media survives on crumbs from RIL as much as any politician or political party. Why would the media be interested in biting the hands that feed them? As for who really runs the govt and minds its store, your guess is as good as mine. AK would do far better first investigating the media before fiddling with big business houses. But he too believes the media is his friend. Superb! The analogies you draw. My God! How do you do it, not once, not twice, but repeatedly. Very informative not only on Media Nexus here but also for that tidbit on Martin Scorsese. Never knew that before I read you. Great Analysis. I really feel, the more we dig dirt out of the system, more we get trapped ourselves. Just imagine the whole system working for one private investor against some other investor. When you say Neither Congress, nor BJP & not even Narendra Modi can sustain without Ambanis, you make a realistic point. But instead of talking about the whole system Rot, the nationalists young men should focus on who the best alternative is amongst the lot. My Vote still goes to Narendrabhai. In ancient china since beginning Rulers were much afraid of business men compare to outsiders..
without being melodramatic it is a shame that the ambanis control india's destiny to the extent they do . multinationals do play a role in the destinies of western nations as well but over there the rule of law prevails and woe betide even the high and mighty should they fall foul of the law . 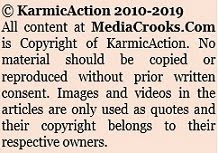 here the ambanis are a law unto themselves and woe betide anyone who falls foul of them . i do not admire dhirubhai ambani at all. Now I am feeling like a slave. Looks like Ambanis are the only proud Untouchables of India. growth on solid business ethics(correct me if I am wrong here). They were on sale, hence they sold... as simple as that. AK would do far better first investigating the media before fiddling with big business houses. But he too believes the media is his friend." I wish AK seriously studies these thoughts to review his own plans. Therein lies the answer to the question how long AK will be tolerated, forget being accepted(! ), by the media. Some may soon begin to call into question his wrongs, or some may come under mysterious attacks, offers, and happenings. We saw some of that when houses of Kumar Vishwas and Sisodia were attacked recently. AK got to be careful in planning his strategy, and execute it well. Else, Congress may gain an upper hand soon.